Eelco Wijdicks is Professor of Neurology at Mayo College of Medicine. Eelco Wijdicks has written numerous books and scientific articles on the clinical practice of Neurocritical Care. He has been enamored with cinema−and neurologic representation in fiction film and documentary. He has written film reviews for NEUROLOGY TODAY and LANCET NEUROLOGY. He is the author of a major publication on the portrayal of coma in film and its potential effect on the viewing public. Eelco Wijdicks is Professor of Neurology at Mayo College of Medicine. He is the Chair of the Division of Critical Care Neurology and attending neurointensivist at Mayo Clinic Hospital, Saint Marys Campus. He has written numerous books and scientific articles on the clinical practice of Neurocritical Care. He has been enamored with cinema-and neurologic representation in fiction film and documentary. He has written film reviews for NEUROLOGY TODAY and LANCET NEUROLOGY. 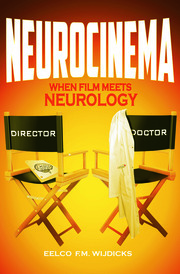 Dr Wijdicks is the author of a major publication on the portrayal of coma in film and its potential effect on the viewing public.